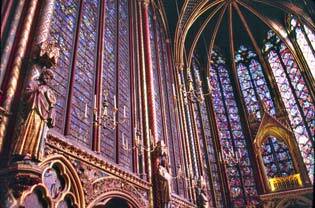 If you think of stained glass as the medieval counterpart to a movie, one church--Sainte Chapelle in Paris--qualifies as the IMAX of the Middle Ages. Its 15 tall stained-glass windows portray 1,134 scenes and have a combined surface area of 618 square meters or 6,652 square feet--nearly twice the size of a typical IMAX screen. ABOVE: Sainte Chapelle's upper chapel. INSET BELOW: Exterior view from the courtyard of the Palais de Justice. Sainte Chapelle was built to house relics from Christ's Passion: among them, the Crown of Thorns, which Louis IV--later to become St. Louis--had bought from the emperor of Constantinople in 1239. The "Holy Chapel" took only six years to build and was consecrated in 1248, just three years after the towers of Notre Dame were completed a few blocks away. The Gothic-style church has two levels: the lower chapel or chapelle basse was the parish church for the palace, while the upper chapel--the chapelle haute with its spectacular stained-glass windows--was reserved for the royal family and the holy relics. Much of Sainte-Chapelle was damaged in the French Revolution, but most of the statues were saved and two-thirds of the original 13th Century windows survived. The church was deconsecrated in 1803 and restored later in the 19th Century. Today, it looks much like it did nearly 800 years ago. For pictures and descriptions of the two chapels, and for visitor information, continue to the next page or use the navigation table below. Top photo copyright © Kenneth C. Zirkel. Inset photo copyright © Pierrette Guertin.